We are here to help! General Interest. This is a collectors item and never used. We cannot show the item as a gift, as second hand or at a lower price. 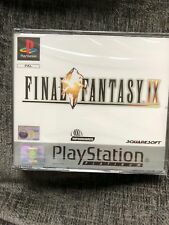 Final Fantasy XI ps1 Brand New And Sealed. Condition is New. Kept in very good condition and probably the best condition one online and hence the price. No issues on the case and cellophane which is very rare. No returns if the game is opened. It will not play on NTSC format consoles from countries such as the USA and Canada. The box and its contents are all in good condition and the discs have only very minor marks. Make Supersized Seem Small. Final Fantasy VI (6) For Super Nintendo SNES PAL (English Version). Discs are mint. Inlay and manual are Dutch. A lot of permanent bonuses more. billions of resources. Level 1 astral shrine. Level 1 magitek converter. Level 8 mythic forge. Level 1 casino. Final Fantasy The Spirits Within UMD PSP BRAND NEW & SEALED Free uk postage. Final Fantasy The Spirits Within UMD PSP. BRAND NEW & SEALED with PSP strip. Region 2 & 5. Please see all photos for a closer look. Any questions please feel free to ask. Free uk postage. Includes a steelbook showcasing the unbreakable bond between King Regis and Noctis PLUS bonus digital content. Get ready to be at the centre of the ultimate fantasy adventure. Weapon: Masamune (FFXV) - The legendary sword Masamune is back, specially redesigned for FINAL FANTASY XV. A used copy of Final Fantasy VII Crisis Core for the Playstation Portable. Tested and working. I will post first class within two working days after payment is received. Please note I am only willing to sell to buyers within the UK. Happy to answer any questions. Many thanks! Slight scratches on disk one but disk two and three the instructions and inlays are in perfect condition. This is agood clean and fully complete copy Final Fantasy Legend 3. 4 x Nintendo DS Games. They are as follows:- Final Fantasy Crystal Chronicles Rings Of Fate - Complete and in very good condition. Unsolved Crimes - Complete and in very good condition. Trauma Center Under The Knife - Complete and in very good condition. Mushroom Men Rise Of The Fungi - Brand new and sealed. Pictures are of actual items you will receive. From a smoke free home. Payment by Paypal only. Thanks for looking! Probably not usable but would look nice in collection. Good condition, Minor scratches to disc, works perfectly. Condition of discs unchecked. All titles in pictures. The CD is presented inside a slipcase featuring artwork from FINAL FANTASY XIII, and also liner notes that are written by the composer. Platform Microsoft Xbox 360. Item is complete. Everything else is near mint and unused. All are CIB with Manuals and all Discs complete. Great set for any collector. Cases are all clean, tidy and in-tact. Only note is FF8 has a slight hairline to front of case (see pic #10). All teeth to hold discs are in-tact too inside each case. You will receive exactly what you see in the photos. This is for a working PAL version of Final Fantasy VI (6), on SNES, released in 1994. Sadly Final Fantasy VI was never ever released over here in England on PAL for the SNES but fortunately this is a conversion from NTSC to PAL that works on any PAL SNES. The game comes with artwork from the American version saying number III with the numbering system over there being different when they released the titles. Cartridge has been tested to make sure it's plays and works fine. Please note there is a bit of marking where the cartridge has been soldered at the bottom but it plays absolutely fine. Language is in English. Game and Cartridge comes in VHS case for protection. 5 Great Playstation Games. Including final fantasy XI. 5 Great Playstation Games. . Doom no manual broken back case Dracula 2 complete Final fantasy IX no manual Tony hawks complete Time crisis just box Red alert complete. Phantasy Star 2. Final Fantasy 7 (complete). Final Fantasy 9 (complete). Biohazard 2 (complete). Biohazard 3 (complete). Biohazard trilogy (complete). Biohazard Zero 0. Last Bronx. New listingFINAL FANTASY XI ONLINE THE CANADIAN COLLECTION.PC DVD.NEW AND SEALED. FINAL FANTASY XI ONLINE THE VANA'DIEL COLLECTION ON PC DVD.NEW AND SEALED.SEE PICTURE.ANY QUESTIONS PLEASE ASK.THANK YOU. PS1 Playstation 1 Final Fantasy Chronicles [Greatest Hits] NTSC US/CA Like New. Condition is Like New. Dispatched with Royal Mail 1st Class Large Letter Signed for Very slight Scratch mark on back of the retail box. Disc and Manual are New and Unused. This is anexcellent clean copy Final Fantasy Legend 2.